video: Kate Moss in Dior addict shock! The 90-second spot of Kate Moss’s commercial for the upcoming Dior Addict lipstick, which hits stores next month, has leaked. Directed by Jonas Akerlund, who also did Lady Gaga’s “Paparazzi” music video, this film, too, centers somewhat on paparazzi: it starts with Kate Moss in a luxe hotel room before panning to her chaffeured car ride and the subsequent paparazzi scrum (which meets her as she exits to take in the Spring 2011 Dior show). Runway footage is included, but no John Galliano appearance, of course. fashion: Tisci, Elbaz named as potential suitors to the Dior mantel. 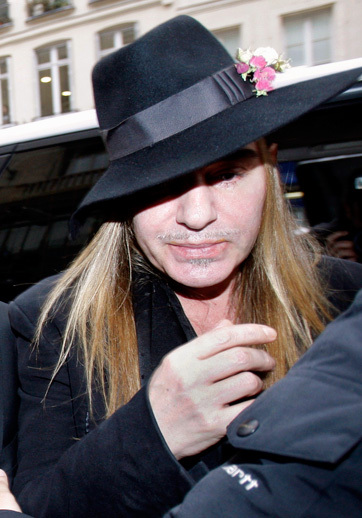 A troubled looking Galliano arrives at a Paris police station Monday morning, who knew less than 48hrs later the ultimate fashion golden boy would be looking for a new job. Not since the greatness of Alexander McQueen has a man so talented seemed so haunted by demons, proving that a tortured genius is required to achieve that level of skill . . .
With style.com already stating fellow LVMH stablemates Riccardo Tisci of Givenchy and Alber Elbaz of Lanvin (formerly of YSL) both being named as potential successors it looks like things will be interesting at 30 avenue Montaigne for a while longer . 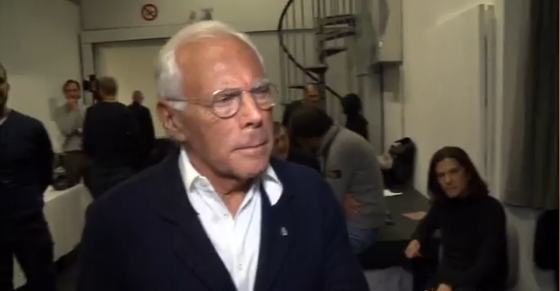 . .
fashion: backstage at Milan fashion week, Armani ‘sorry’ for John Galliano. As thick as thieves? Well, perhaps not, but in the fashion world designers stood with solidarity with one of their own. John Galliano suffering from an initial allegation that he made racial and anti-semetic slurs in a Parisian cafe suffered another setback today with the disclosure of a fresh video showing the clearly intoxicated designer hurling abuse at fellow diners in the same cafe last December. Galliano, 50, was in the French capital’s Marais district – the traditional home of the city’s Jewish & gay community – on Thursday evening, and is believed to have been drinking at café La Perle when he launched the alleged attack on Geraldine Bloch, 35, and Philippe Virgiti, 41. Galliano’s lawyer Stéphane Zerbib on Saturday that the Christian Dior designer has filed a claim of defamation and injury against the couple after visiting police at midnight on Friday to state on the record that he never made any anti-Semitic or racist comments. Zerbib also said Galliano is “shocked” that Dior – citing a zero-tolerance policy on racism and anti-Semitism – suspended him from his job functions pending the outcome of the police investigation.